Tomas Lasansky followed in his father’s (Mauricio Lasansky) footsteps and learned the meticulous skills needed for the craft of printmaking. Tomas’s first major work is an intaglio print self-portrait. Intaglio printmaking is the techniques in which the image is incised into a surface and the incised line or sunken area holds the ink. Once the ink is on the plate which is usually copper you run the plate through the printing press which presses the inked plate onto your paper. Not all prints are same, they vary in color and even design. 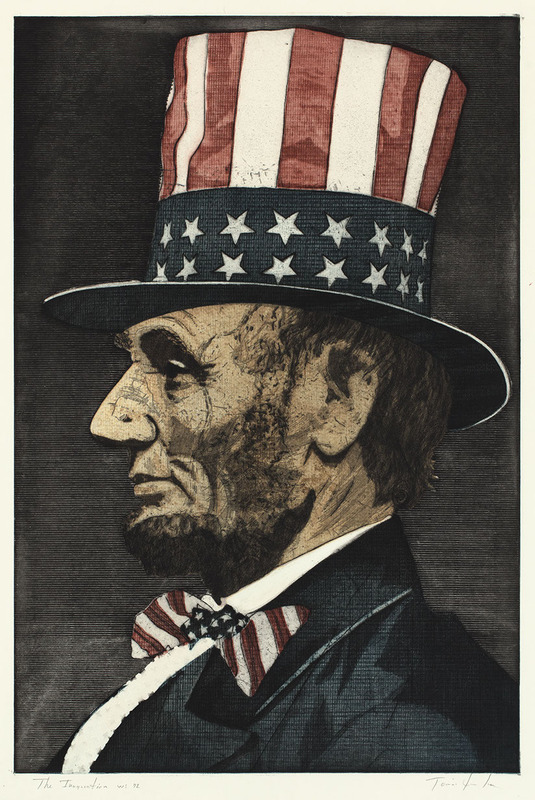 In this particular print, Tomas is depiction Abraham Lincoln a favorite of Lasansky’s. When asked about the people he recreates in his art, Tomas said he portrays those who he has found influential to him.